We are Catholics in full communion with Pope Francis, the Bishop of Rome. Our parish family consists of a wide range of different people, from all ages and different backgrounds. Whoever you are you are assured a very warm welcome at the Catholic Church here in Witham. For directions to the church see the Find Us page. You'll be greeted inside by a member of our welcoming team who will give you a missal, a hymn book and our weekly newsletter. For some people going anywhere for the first time can be a bit daunting. You'll find we are a friendly community; however, if you don't understand something please ask. Our worship is centred around the Mass which is primarily to the greater glory of God. It is called Mass from the final blessing (in latin) Ite missa es’ which means to ‘send out’ just as Jesus sent his disciples into the world to take his teaching to others. Our worship is divided into four parts or ‘rites’. The first part is called The Introductory Rites. We sing a hymn and then have an opportunity to spend a short time reflecting on things we may have said or done that has hurt God and other people. We say sorry and open ourselves to the graces God wants to give to us. The second part is The Liturgy of the Word. We listen to bible readings from the Old and the New Testament and we listen to a psalm which is usually said in this church but it can also be sung. We all stand to listen to the Gospel reading which is the story of Jesus. The priest then gives a homily which is usually based on the readings we have just heard. We complete this part of the Mass by reciting the Creed which is a statement of our faith and then we have a set of prayers to ask God’s aid for the Church, the world and for local issues and people. The third part is known as The Liturgy of the Eucharist; a word which means to give thanks. We offer ourselves to God along with gifts of bread and wine which will become the body and blood of Jesus. During the special ‘Eucharistic Prayer everyone kneels to worship Jesus who becomes truly present by taking possession of the bread and wine as the priest prays this special prayer. The priest doesn’t change the bread and wine – the Holy Spirit does and even though nothing appears to have changed, the change is one of substance; of what it is. Those who are able to receive what is now called Holy Communion process to the altar. Those who are unable to receive are invited to come forward for a blessing, called a spiritual communion. If you are interested in exploring the Christian faith in the Catholic tradition then please come along on a Sunday or contact Fr David or the parish office. You will find a telephone number and an email link on the Contact Us page. Absolutely not! 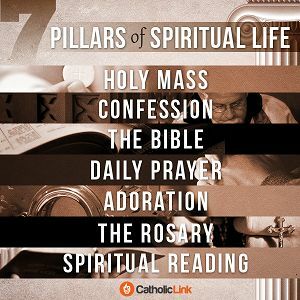 We believe God is with us always and our daily Mass and daily devotions help us to lead lives pleasing to him. We're not perfect and we do make mistakes, but the aim of a Catholic is to show Christ to others and to strive to make a positive difference in everything we do. Our church is accessible for those with disabilities. We have an entrance accessible from the car park that is wheel chair friendly. There is a toilet specially for the disabled and the Hall upstairs is accessible by a chair lift.. We have a loop for the hearing impaired.